My spring of ’72 pledge brothers and I bolted for the weekend to Indiana University of PA to visit our Phi Sig brothers there. The chapter was hosting a party in an empty cinder block building, which they called the Block House. My pledge brothers and I were very accomplished at playing Whales Tales due to our pledge duties at Kappa. We always left cleaning the taps for last so we could play Whales Tales. This practice made us very good as a team. The IUofP brothers asked if we knew how to play Whales Tales. We said we just learned it pledging. The older brothers thought they had some young patsies to pick on. A few hours later we were the last men standing. A few years after I graduated, my wife and I were walking through a store and ran into a high school friend of hers with her husband Ron. We talked and decided to meet for dinner a few days later. At dinner Ron and I started talking to get to know each other when I found out he was a Phi Sig from IUofP who graduated a year before I did. 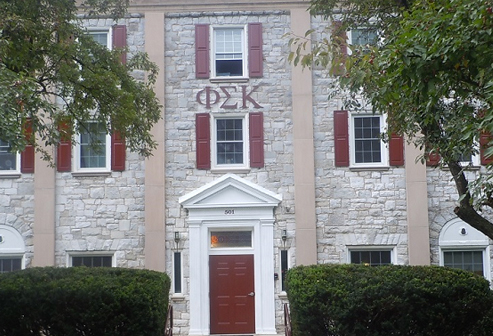 He mentioned that he remembered a group of Penn State Phi Sig pledges visiting his chapter. I finished the story by saying that they took the pledges to the Block House to party and play Tales. His eyes spread wide open. He was one of the brothers who learnt a lesson in playing Tales that night. Small world but Phi Sig has opened doors. Ron and his wife have become some of our closest friends. The most important thing I gained through Phi Sig was my lifelong friendship with fellow Kappa Dr. Dave Morris ’79. At his wedding years later, I met my future wife Martha, who was a high school friend of his. I also learned a lot about life from my roommate and pledge brother, Ron Hummer ’79. I don't know whether our era (the mid-to-late 1970s) was the best or not, but it was a time when the world seemed full of promise and potential experiences. I remember early one Sunday morning, I stumbled downstairs to be greeted by a group of Hare Krishna devotees in orange robes, who'd been invited over by some of my more open-minded brothers who hadn't been to bed yet after a night of partying. These days, I'm living in the Washington, DC area, where I work as a freelance writer for the National Geographic Channel, HowStuffWorks, Urban Land magazine, and other media outlets. My wife and I have a 17-year-old son. I haven't been back to PSU or the house in several decades, but I keep telling myself that I'll shock everyone by showing up at Homecoming one of these days. Hello everyone. ""Pele"" is now in retirement in Austin, TX after completing a 34 year career with Kodak. It was a great ride with assignments in London, Atlanta, Tokyo and Singapore. I'm hoping to become a walmart greeter or the tool guy at Lowes/Home Depot. Keep watching for me, especially if you're in the Austin metro area !! Get in touch if you're nearby or plan to visit. I live in Steiner Ranch. I'm always up for a game of whales-tales or zoom. Living in Happy Valley, married to Jan for 23+ great years! Oldest daughter Katie is a PSU grad '06 working in Baltimore. Second child Anne is studying at the Univ. of South Carolina. If you are coming back to campus, please send an email. Enjoying being a first-time father at age 47. Look for my son, ""Rusty"" Courter, to carry on the Courter Kappa tradition in 2019--assuming he finds a way to pay for it himself! 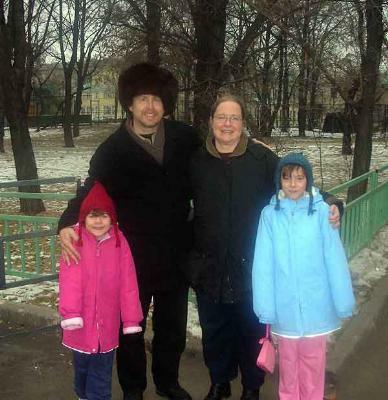 Adopted school-aged sisters, Anastiasiya (Nastia) and Alesya, from Tyumen Russia, 22 November 2005. I won't be able to come for Founders' Day weekend. My fiance, Charlotte (Charli), and I are getting married on March 16.My daughter Briana, age 14, will be Maid of Honor.Charli just started an A+ certification course so we're not going anywhere until at least May. Two daughters and two weddings. My oldest daughter was married September 2003 and the younger daughters is pending for June 2004. Whew! I live in Williamsburg, Vir., and practice medicine with my wife and college sweetheart Kathy Missory '76. I recently had a great vacation with Gene Kilgore (Phi Sig '76) at his home in Lake Tahoe. Maried to Barbie. Two children: Jacyn - 3 years old and Jenna - 9 months old. Please get in touch if you're going to be in town. Same business for 28 years, new location - it was way past time for a change! Look forward to seeing some of you guys soon. My wife and I were married 30 years in August (who would have believed it). Son, Justin (28) is a sales rep in Los Angeles; daughter, Erica (24) teaches 5th grade in Lampeter-Stroudsburg near Lancaster. In June she was married to a minister. Son, Brandon (23) is at home and plans to join the USAF. Im project architect with Astorino in Pittsburgh, currently working on Childrens Hospital with numerous other Penn Staters. My years at PSU and at Kappa were some of the most fun years of my life with great friends and lasting friendships. I think a Kappa retirement home could work if we could only find a way to ditch the wives. Ill bet those 60-something tri-Delts will still be hot. Thanks for the website. It should give everyone a better opportunity to catch up.After 30 years of teaching and coaching basketball it was time for a career change. I am now a realtor with CENTURY 21 and I am enjoying my new found freedom as a ''self-employed"" person tremendously.My oldest child, Maegan, just graduated from PSU in Dec 05 with a degree in Sports Communication / Journalism. My next child, Aaron, is a freshman and New Your University and doing well. The youngest, Adam is a freshman in high school and trying to adjust to being an ""only"" child. Anyone from the Fall 75 pledge class should call me for golf when near Boston, even Wally P.
I lost all the email addresses to my old brothers around a year or so ago and would like to get back in touch. Miss the snow, football and great times at Phi Sig. I live in Ponte Vedra Beach, Fla., and occasionally see Pete Caruk. Have two kids--Sarah (10) and Joey (14)--and wife Alexa. Hello to all Phi Sigs!After having lived in the Pittsburgh area for twenty-five years we moved ""back home"" to Erie last year.Great to see Joe Pa back in the top 20.Also, thanks to Bear Kohler for all his years of service.